We have numerous classes - Zumba Fitness, Zumba Toning, Zumba Gold, Zumba Circuit - all over Singapore every day!!! **Note: Below is just a general weekly schedule. Usually the schedule do not change much except during public holidays. For most updated schedule and to book a class, please click on "Classes". 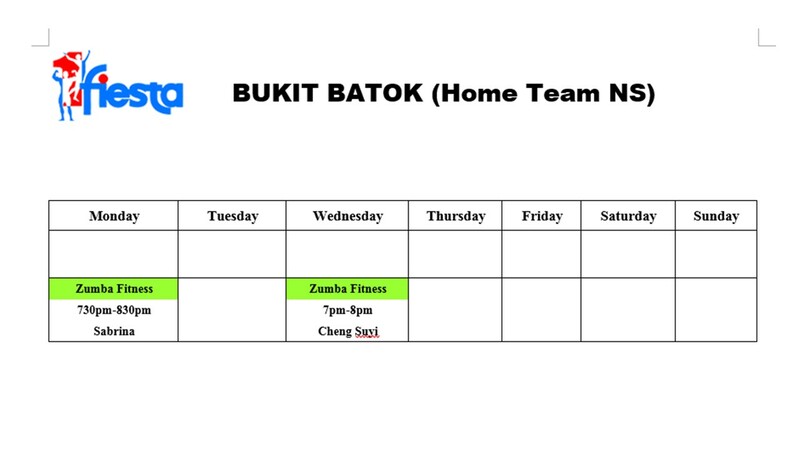 *** Note: As the Zumba Classes here are a collaboration with NS Home Team Bukit Batok, registration will have to be made by signing up at the Bukit Batok Club House Front Counter on the of the start of the new term only. Charges will also be different. *Term for Zumba Fitness is for 8 fixed lessons. Each Lesson is limited to 25 pax. ***Note: Starting in July 2016, the Classes at Bishan Sports Hall will be under ActiveSg. Please kindly sign up via ActiveSg website for the classes. We are also looking for studio to hold classes in other areas of Singapore. Do let us know if you know of any good studios for rent. Now that we have brought Zumba Fitness Classes near you, there is no excuse not to dance!!! hi, saw that one of the locations in Ang mo kio but no classes are available there at the moment? couldn’t find any classes in book class for ang mo kio ? Can I know if the tampines studio is available for booking for this saturday. 1 to 2pm or 2 to 3pm? Urgent, please advise. How about the newly revamped Nee Soon East studio? Unfortunately we cannot rent any CC locations to conduct Zumba as they have their own instructors and classes. I saw that one of the locations in Balestier but no classes are available there at the moment? We have now stopped teaching at Balestier on Thursdays, you can now attend our class at Bishan Sports hall instead at 7.30pm. Please advice 8th sept Yio chu kang 2000-2100 is it open? Few friends and I would like to join that class. Due to the overwhelming response at Yio Chu Kang, we have changed the Yio Chu Kang classes to a monthly package class. Hence, I am afraid that you and your friends will only be able to join the October classes. We will open the classes for registration 2 weeks in advance. I was wondering if the Boot camp class held on Fridays at Waterloo Centre,is open to everyone and there is no booking required? How much is a class? Yes it is available for everyone, please rsvp for the class through our website, we do accept walk ins for this class but it is guaranteed you will have a space if you RSVP. Class is $12 payable by cash to the instructor or if you have one of our punch cards then you can use that also. I am keen to join- just wondering what’s the difference between “Zumba Fitness”, “Zumba Toning”, “ABT”, etc? Which one is recommended for starters? I am totally new. May I check are your zumba classes are for beginners. I want to attend your class but not sure if there is any class for beginners as this will be my first time to join zumba classes. As a beginner, you can just join in any of the Zumba Fitness Classes. It is common that it takes most people a few classes before getting the hang of the class. So don’t worry if there are a couple steps that you can’t catch during the first few classes. At any point of time you can’t follow the instructor, just anyhow dance to your liking. There is no wrong steps in Zumba as long as you don’t hurt yourself. You just need to keep your body moving. Zumba is not about learning the dance for competition or for a performance. Zumba is about having fun and have a great time, and getting a good workout in the process. So just let your hairs down, have fun and enjoy the class. You will also start to know how the instructors give the cues after a few classes and then you will find it easier to follow the class. It is the same for most things. After a little while, as you do more, you will find it easier and easier to follow the Instructor. Just give yourself about 5 to 10 sessions to get used to it. Hi i am interested in the class at bishan and yck. How shd I register? Please kindly just register as an User on our website, then login to your account, go to the “Classes” page to find the class that you would like to attend, click on “Sign up” and then “RSVP” to book a slot in the class. On the day itself, please arrive 10 mins before the start of the class to make the payment to the instructor. Cash only please. A Class is open for RSVP 1 week in advance. 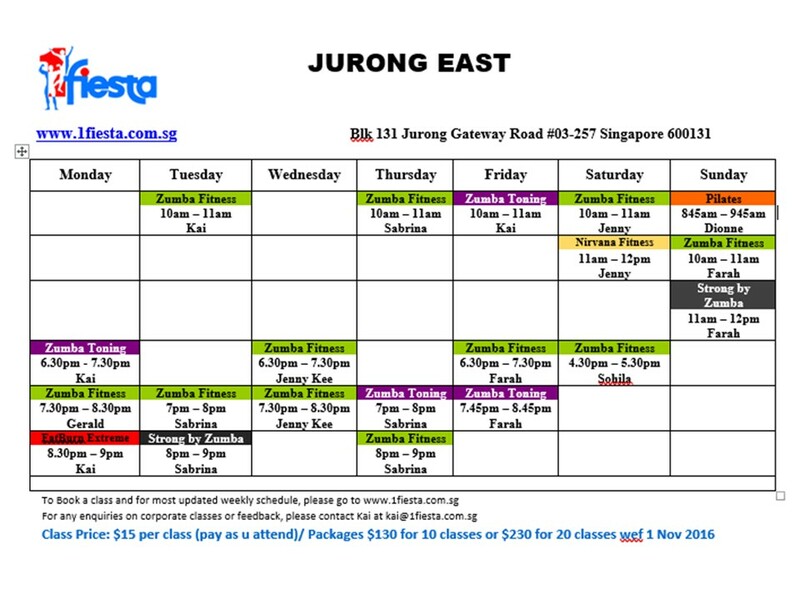 For Zumba classes in Jurong East on every Wednesday, must we make any reservation to join the class? We are trying to encourage everyone to RSVP for all classes, so please continue to do so. Hello, is it possible for a non-dancer to join zumba class? I would like to join for health and exercise purpose only. Is that ok? How do I register for Bukit Batok class? Can I go there and register on the spot or I need to register in advance? Yes all our classes are suitable for all levels. You can register for our classes in person at Bukit Batok, next registration will open on 1st December at 10am, spaces are limited so you must go early. Class will start on 8th December. I’m visiting from overseas and will be staying with my parents at Woodlands for close to three months. Is there any membership fee? And is there a special monthly fee instead of the per class based payments? We do not have any registration or membership fees. You can just pick which class you wish to join and pay $12 on arrival, or you can purchase a punch card from any of our instructors for either 10 or 20 classes. 10 classes cost $110 and 20 cost $200. At present we are renting the space at Woodlands so can only provide classes at timeslots that they have given us. We are looking into possibly extra classes here but cannot confirm anything yet. Hi..any classes scheduled at Jurong West Central please?? At this present moment we do not but are currently looking into this so we hope to start classes in the West very soon. Can we request for more weekday evening classes in hougang sports hall? I’m sure there are many zumba lovers staying at the north east area waiting to attend Zumba classes like myself after work. We would love to conduct more classes there, but the dance studio is fully booked. We will continue to try to ask for more slots. Is there any class opening soon in Woodland? We are doing a trial class at 11 Woodlands Close next Tuesday evening, 16 Sep, to see if everyone finds the location ok. If everyone is ok, then we will start the class on 1st Oct. At the moment, it seems like the trial class is full. Will there be any class in Woodlands? Yes, we will be starting 2 classes at Woodlands starting from 2nd Oct 2014. The classes will be on every Thursday night, 8 – 9 pm and Sunday morning 10 – 11 am. When can I sign up for the zumba class on a sunday at Woodlands Close and how many session? You are able to RSVP for the class one week in advance, at the “Classes” page. At 1Fiesta, you just need to pay by per session, pay as you go. So you won’t lose a class if you can’t make it on a certain day. The class is at a promotional price of $10 per class. Had the chance to attend Elisa and Shannon’s class these two wks in the evening which we wouldnt have the chance to attend their morning classes normally. I think they are awesome and their classes added much variety! May I know woodlands have zumba classes? At the moment we do not have any classes in the Woodlands area, we are currently looking for a new location in the area. Yes the class is still on, you can rsvp to the class by finding the class you wish to attend under our class schedule and then click yes on RSVP (you must have registered with our website before doing this) once RSVP if you can no longer attend please make sure to ammend your rsvp to no. May I know bukit gombak class still available? May I know if I go for ABT lesson at water loo centre . Any changing room at there? Any other places have ABT lesson ? Yes we have a toilet area where you can change. At the moment we only do ABT at our Waterloo studio. How often is your Zumba circuit conducted? And what are the workout included in the circuit? Thanks. 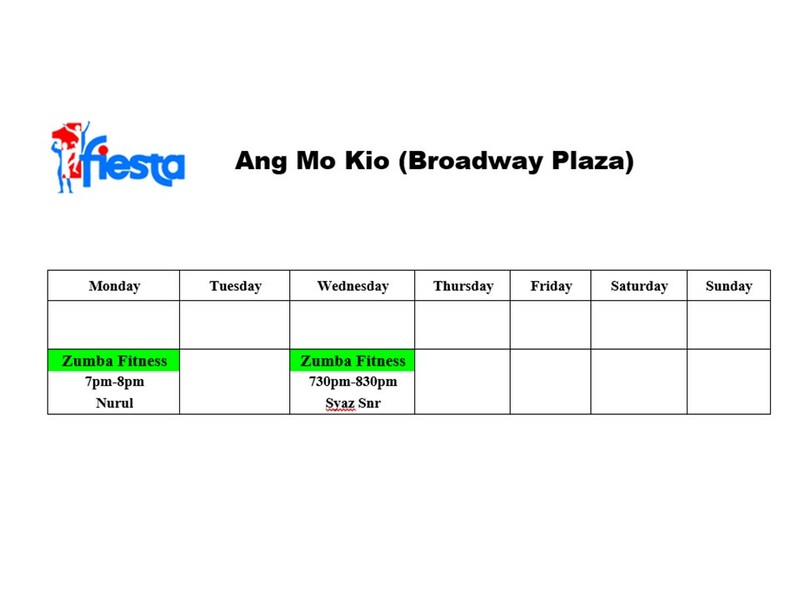 We have Zumba Circuit at Waterloo every Thursday 7 – 8 pm and at Tampines every Friday 6.30 – 7.30 pm. We will work on different muscle group every session. But for each session, there will be both upper and lower body and core workout so you can expect to have a whole body workout. Our studio is located at Tampines Swimming complex, just beside the entrance of the swimming pool, unit #01-02. Our Classes are at $12 per class, pay as you go. You can also purchase a punch card – $110 for 10 classes and $200 for 20 classes. Each time you come, we will punch away one session. Punch card is valid for 6 months and you can share with your friends. Can I confirm if Gerald will still be conducting at Tamp on every Wed 7.30pm? I heard last week will be his last week there. He is just announcing that he will not be there this coming wed ( 9 Apr 2014 ) as he is going thailand this week. He will be back to teach the class from next wed onwards. I stays in Woodlands and werkin at Pandan Loop (near West Coast market). The classes at Woodlands are going by $12 per class, pay as you go. We have stopped selling punch card / package at the Woodlands classes as SSC is planning something for their own program and they are still unsure whether will they be able to continue to rent us the dance studio after the end of apr 2014. Just RSVP on our website to book a slot in the class. A class is open for booking one week in advance. Hi,I stayed at Woodlands near Causeway Point area. 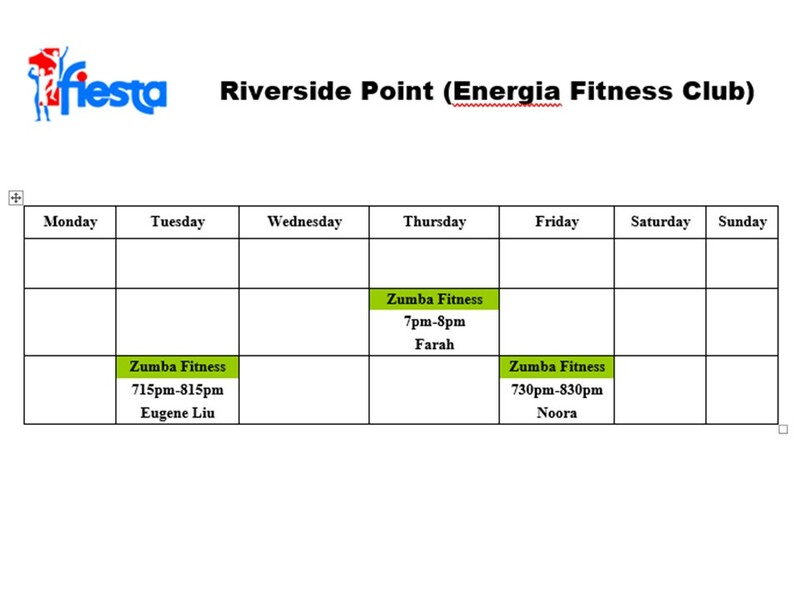 I would like to know what is the address of where you are having the zumba classes, its schedule and cost. We used to rent the Dance Studio from the Woodlands Sports Complex, but they have taken back the dance studio to conduct their own programs. Hence, we are still looking around for alternatives at the moment. Do add us on Facebook to receive our updates and will inform you from there if we found a place. The nearest location we have to CCk is at Home Team NS Bukit batok (near Bukit Gombak MRT). But the classes at home team NS Bukit batok is by a 8 session term package. We have yet to find any available location around sengkang area to open classes there. If you do know of any dance studios around the area which is ope for rental, please do let us know. Thank you. Maybe you can try the Sengkang Community Centre? Hi, I’m staying in choa chu kang. Will you be conducting any class around this area or intend to open any? At the moment, we are in talks with Singapore Sports Council to launch Zumba Fitness at the Sports Stadium… So hopefully things will go through… The plan is to start around April if things are successful. Do keep a lookout for us. My friends & I we’re looking for Zumba classes. We live in Bukit Batok Central. Luckily I saw that you have classes in the this area. But we’re wondering how to register and how much? Thank you. The class is held at Bukit Batok Home Team NS. As the Zumba Classes here are a collaboration with NS Home Team Bukit Batok, registration will have to be made by signing up at the Bukit Batok Club House Front Counter on the of the start of the new term only. Charges will also be different. *Term is for 4 fixed lessons. Each Lesson is limited to 25 pax. Hi I was wondering if you have any ladies only zumba sessions anywhere? Thanks. Sorry, we do not have ladies only class at the moment. But most of our classes turns out to have only ladies attendees. We will consider opening a ladies only class in the future. Thank you for your feedback. I’m staying in the north & found balestier’s class convenient. But realized that the registration has changed & take place at Bukit Batok instead of Balestier. It’s so inconvenient. So, to attend the class in Balestier, I need to go down to Bukit Batok to register? Can the registration be done in Balestier instead? Balestier has to register at Balestier Home Team NS. Bukit Batok Home Team NS only take charge for Bukit Batok. We are talking to Huogang Sports Council, hopefully they will allow us to open classes there at Huogang. Hey guys, could you resume posting dated schedules? I was not aware the session at waterloo 5.30 by farah was cancelled as it wasnt shown here. thanks, no worries just thought a suggestion would be good. merry Christmas guys! We will not be updating the latest changes on this “Class Schedule” page. We will update the changes on the “Classes” page. We try to encourage everyone to RSVP for the classes on our website so as to help us monitor the expected class turn up rate. I had also stated that “For most updated schedule and to book a class, please click on “Classes”” on top of the Class Schedule Page. I will try to highlight it as it may be easy to miss. Is the schedule updated already?? Shannon’s name is still there…. Anyone taking over trim and tone? Classes also not updated ? G is not doing 90mins anymore right? RSVP in this site is not V user friendly. Many stil prefer using meet up. One good thing about meetup cos it immediately lock into our calendar and gives reminder. G is still doing 90 mins at the moment. I’ve stopped Zumba-ing ever since Connie/ Aaron’s class was removed at City Square as the other locations are not convenient for me. Will you guys be resuming classes at that location or planning to have more locations nearer to North Central area like Serangoon? Bishan works for me too but the timings are just too limited and there are no classes on weekends at all. A more central location would be great too, and it will be good to have more classes on Saturday. Noon to early afternoon is the best. Hope to resume Zumba again but for now, its really not possible due to my busy weekday schedule and limited locations & classes on weekends. Sorry, forget to mentioned that it’s for class at Bishan on 7 Nov and would like to bring 3 friends along since there are still 4 slots available. Thanks. Hi, I had just book for a class on 7 Nov and would like to book for 3 other friends. Can I do it here? I am sorry. I am afraid that the thursday class this week is full… You can add them as your Guest when you RSVP on our Meetup next time. Hi, I know that there are a number of evening classes on weekdays at Bukit Batok…. but would there be any possibility of starting any classes in the mornings? Thanks! We can if the response is good. Currently we have a morning class on every Saturday but response have not been great. So we may not be opening another morning class unless there is more demand for it. Hi, Will you be having Friday evening class at Changi ? Not at the moment. We will just be having a one off Zumba Party at Changi CARC on 10 May 2013. Our regular weekday evening class will still be on Wednesday evenings. May I know if there is any afternoon classes available? 3 or 4pm? Seems difficult to find classes at these slots. Sorry… We do not have classes at around 3 or 4 pm at the moment… We will look into it if there is more demand for classes around that timing. Hi.. im very interested to start learning and enjoying zumba.. But I hope you would have a studio around west coast / clementi area. I saw there are plenty of space for rent in West Coast Plaza.. Im sure a lot will join there too! Thanks! I don’t think we are ready to open a totally new studio at the moment. However, if there is a good, fully equipped dance studio to rent by per hour basis in the west area, please do let us know and we can see if we could work something out. 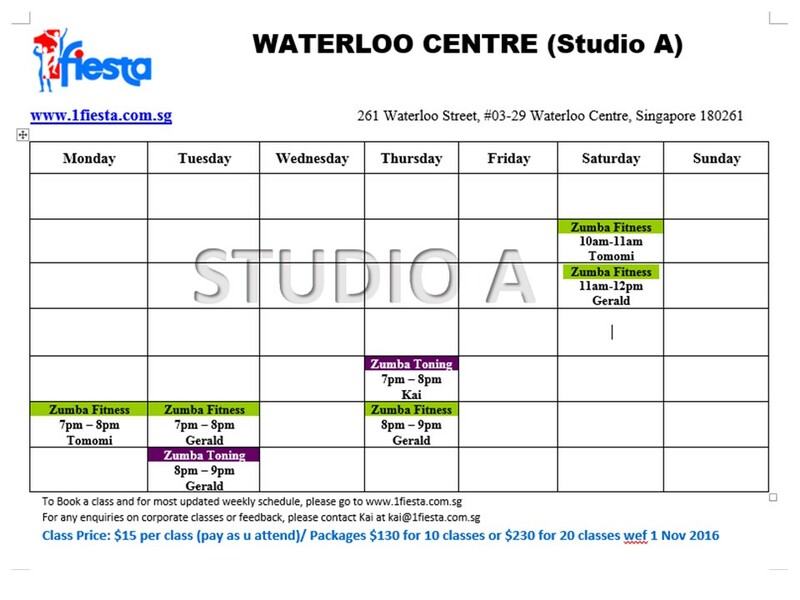 Hi, is your class schedule for waterloo studion for Nov out? Hi,is it possible for u guys to conduct classes at jurong green cc? Are you asking for a private class for your company or your group of friends or are you asking us to open a class there? To open a class there, we will need to check on whether are we able to rent the place or not and how feasible is the location. But if it is for a private class for you, it should be easier to arrange. I’m interested in joining the zumba class. May I know if the classes at YCK still continue after teh 21 Aug? Yes. The Zumba Class at YCK will continue for now until end of Oct 2012. Then we will need Grassroots to confirm with us again. i’m keen to go for a trial class at tampines Sports Hall. How can i register for the classes? It will be great if you can RSVP through our Meetup site. You can just walk-in, but it will be best if you could just RSVP on our meetup site. That will give us an idea of how many people we could be expecting. But don’t be worried if you see that our RSVP is full. Just put your name down on the waiting list and if you are the top 15 in the waiting list, you can just come down. There will usually be last minute people pulling out and also we do cater some spots for walk-ins. So we can just fill you into the spot. Just come about 10 – 15 mins before the class starts to check yourself in with the instructor conducting the course. It will be $12 per class. No Sign up or other registration fee. So there isn’t really such thing as “trial class”. Just pay by per class as you attend the class. If you like the class and want to continue with us for a cheaper rate, we also do have a package of 10 classes for $110 and 20 classes for $200. Just enquire about the Punch Card from the instructor. Thanx Kai for your reply! Which is your most “Golden” year Gold class, please? I would really like to give it a try but I have a psychological barrier, can u please advise me which location would have the 45+++ age group? Thank you and I am eager to start soon. I have missed the starting class, should I wait for the next new Gold class to join? We do have a Zumba Gold Class every thurs Morning, 10 am – 11 am at our Waterloo Studio. Alternatively, you can try out our Fiesta Suave class on Wed evening, 7 pm – 8 pm at our Waterloo Studio as well. Fiesta Suave is our in-house latin dance based fitness program, similar to Zumba Gold. The only difference is that as Zumba is a licensed program, we have to use Zumba music. But as the instructor prefers to use his own music, we decided to call it a different name so that he is more free with his choice of music and dance moves. Hope to see you in class soon. Hi juz passed by your studio Saturday about 11am. Saw 2 classes one in the first room of 5 middle aged ladies and another with a whole group of young people 2 rows facing each other. Maybe that’s Zumba as put on the poster outside your studio. Do you have class for 45 year olds? Your morning classes are excellent timing for me. Thanx! Yes. That’s Zumba. The class where there were 2 rows of people facing each other was the Instructor Training course that we were having on that Saturday. If you prefer a slower paced class, you can try our Zumba Gold Class. When you feel that you are more getting fitter and more confident of the moves, you can join in other Zumba Classes. Alternatively, it is ok for you just to join in any of our Zumba classes. If at any point of time you feel that you need a short break or a drink, you can just stop and take a break. Or if you feel that it is hard to catch a certain steps that the Instructor is doing, you can just anyhow move about. There is really no right moves or wrong moves. Zumba is about having fun and keep your body moving. The basic idea is that when you keep your body moving, you are exercising. So don’t have to worry about anything at all. Just have fun! Hi, may I know will there be any zumba fitness classes in Jurong area? Don’t tell me Bukit Batok, cos there’s no more vacancy…. I came for the Zumba in the Circuit class on May 17 and left my shoes behind – is it possible to pick these up today? They are a pair of Saucony running shoes in a Shop and Save plastic bag. Which Zumba would you recommend for a beginner? I stay at toa payoh, any studio near my place? Thanks in advance for your prompt reply. You can just give any of our Zumba Class a try. If there is any point of time you find it hard to follow the instructors, you can just move at your own pace. The important thing is to keep your body moving and have a good workout. However, if you are still concerned, you can try the Zumba Gold class. Zumba Gold Class is at a slower pace and is easier to follow. We are currently trying to work out some schedule to start a Zumba class in Bishan. Perhaps you could check back with us in about a month’s time. Thanks for your prompt respond. 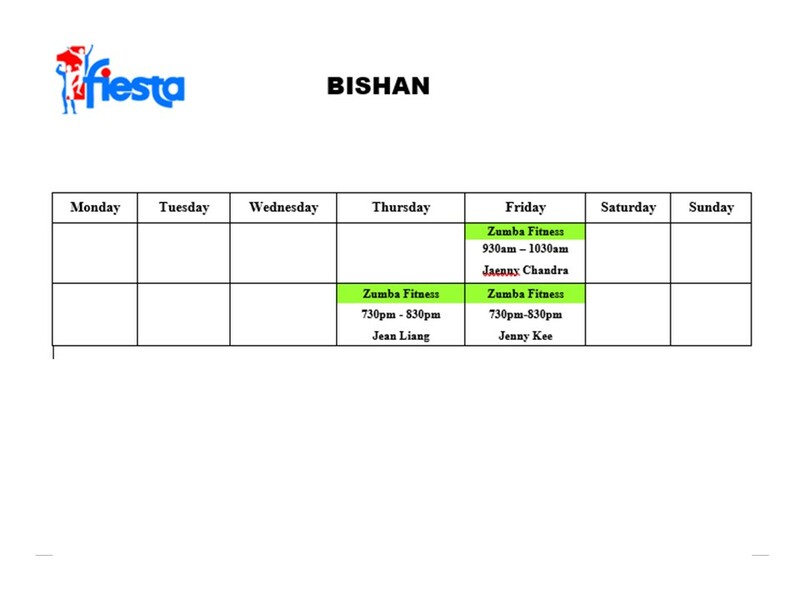 I am so excited to hear that Bishan is going to have a Zumba class soon. Well, I shall check with you again early June if the class is confirmed. Thanks! Our Zumba class is starting on this wed morning and this thurs evening. 7 Jun 2012, Thurs for 7.30 pm – 8.30 pm Class. Am interested in Zumba Toning. Cld u pls tell me when it will be schedule and where? Am staying in Yishun and prefer a weekend class or aft office hour. Thks. 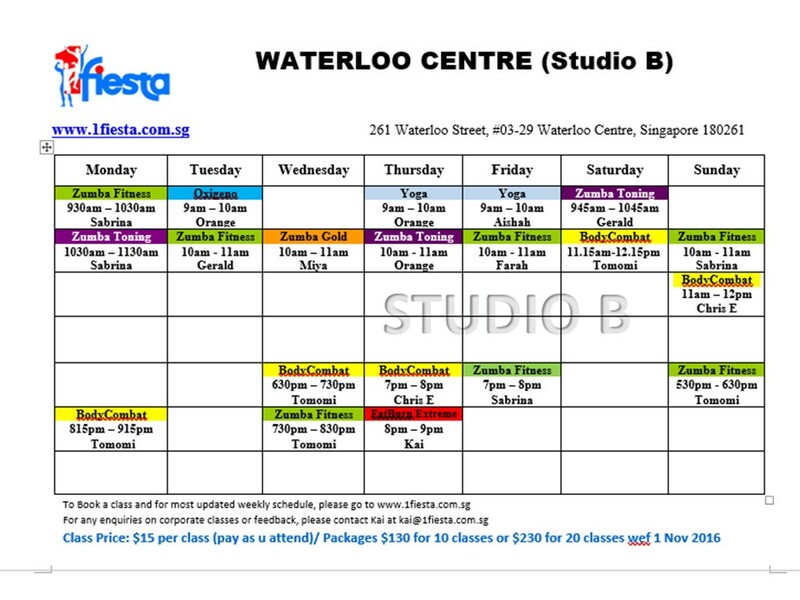 At the moment, we only have Zumba Toning at Waterloo Centre. The Zumba Toning Classes are on Tues evening 8 pm and Sat 9.30 am. Thanks Gerald for your reply. Yes I am attending the Tuesday class at Grassroots club. I wish you could have more classes at the club because the Tuesday class is really packed and it makes the place really cramped. Thank you for your support. Yup. We wish that we are able to have more classes too. But we are limited by the availability of the studio there. If you do know of any dance studios in the area that is available, please kindly let us know. Yes. We would prefer everyone to register with us through our Meetup site (www.meetup.com/Zumba-Singapore/) or make advance payment for the class through our “Event Registration” through our website. It is $12 per class and it is on every tuesday evening. But unfortunately, the yio chu kang class is full. I would suggest you to try again in June. Kang in the evening on weekday? weekday morning as i am a housewife. 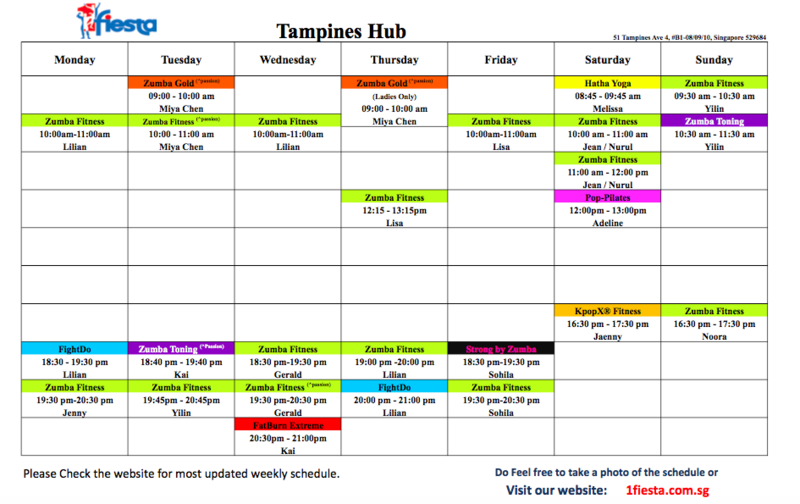 We are currently working with the sport council to add weekdays morning class at Tampines… Will update you once we have the confirmation. We are now opening 2 classes at Bishan Sports Hall, Dance Studio. 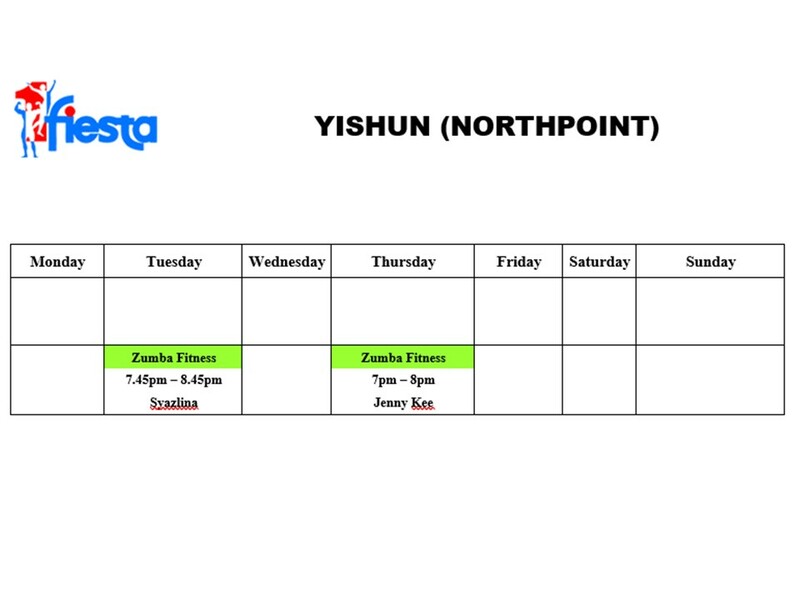 6 Jun 2012, Wed for 9.30 – 10.30 am Class and 7 Jun 2012, Thurs for 7.30 pm – 8.30 pm Class. The class is held at the Dance Studio in the Home Team NS Bukit Batok. Please visit the website below for more details. *Note: Each lesson is limited to 20 pax. Walk ins are subjected to availability and are selected based on first come first serve basis. For advance booking (walk ins) , please contact Edi at 6665 4609 or events@hometeamns.sg.